WCW could have made money on Bash at The Beach 1995. Instead they held it on a beach and didn’t charge an admission fee. There is a plethora of arenas in California and with the two big matches being Hogan vs Vader and Flair vs Savage, they could have drawn a good number at the gate. Nothing outstanding but maybe $175k and you could still do the beach theme. WCW and Baywatch teamed up to film an episode starring Hogan, Savage, Sullivan, Vader and Ric Flair and it led to this show being held on a beach for free. Maybe have some of the stars of Baywatch show up, not Pam Anderson since she did WrestleMania earlier that year. Hasselhoff would have shown up if he could sing the national anthem or write the theme song for the show. Find an arena in California and film everything at the arena instead of losing money on this show. Now I’ll admit, WCW did a very good job with the set design and it looks much than I expected upon watching the show again and at-least it’s a one-off event. It’s not like WCW would run another one of these events and make it a series of events, right? Well, you’d be wrong. We’ll get to the Road Wild shows one day, just you wait. Besides the fact that WCW ran this show for free, they couldn’t even be bothered to put on a good show or something that is watchable. This is a show that has good workers like Ric Flair, Randy Savage, Sting, Paul Orndorff, Bobby Eaton, William Regal and Vader performing in subpar matches. The undercard has two matches that were rated with the dreaded negative star rating by Dave Meltzer and one match was given a DUD. Surprisingly enough, the Renegade match was not the recipient of the negative star rating from Meltzer. Sting phones it in against Meng, or was putting some effort in until Meng dropped him right on his head with a brainbuster. Or when he jumped right into Meng’s foot, full force. Randy Savage and Ric Flair have a disappointing lumberjack match that I’ll cover and most of all, the start of the most tasteless angle since Fritz Von Erich faked a heart attack. This was of the worst shows WCW put on until three months later when the lunacy known as Halloween Havoc 1995 unfolded. This is quite the feat for a major wrestling show to have two negative star matches, one having two of the most underrated workers in the business involved. The “triangle match” for the WCW Tag Team Championships against Harlem Heat (Champions) and The Nasty Boys. WCW had used the triangle match gimmick at Fall Brawl with Vader faced The Guardian Angel and the winner facing Sting. Here, they abandoned the concept right away and had a regular triple threat match that not only happens to be bad but has a terrible finish. The match is awkward since a match like this was in its infancy so it’s just random tags with not much going on. Regal backhanding Booker was great thought. The finish sees Booker on-top of Regal and Saggs sitting on the two of them for the victory. Sounds like a good way for the Nasties to win but Harlem Heat technically won since Booker was on-top of Regal, despite the ref starting to count when Saggs sat on Booker. The second negative star classic was Jim Duggan vs Kamala, a feud that had started a decade ago in Mid-South and was revived ten years later in WCW. Kamala had feuded with Hogan in the eighties and the company was loading up on monsters for the Hulkster to slay. That’s it. Duggan is basically here to set Kamala up as an opponent for Hogan. The two had some fun brawls in Mid-South but it’s a decade later and both men are in the twilight of their careers. It’s plodding with Duggan trying to knock down a guy we see The Undertaker beat up three years prior and the announcers start talking about everything else except for the match. We also have an extended bear hug spot to kill time and one of two Ed Leslie appearances. Some shows have a bad main event but a great undercard while others have a dreadful undercard with a great main event. If I had to pick, I’d rather watch a show with a great undercard and a bad main event. Sting vs Meng for the United States Championship isn’t a bad match thanks to Sting having good chemistry with monsters who hit him full force. I feel bad for the poor Stinger, getting knocked around by Vader for two years and then booked into a feud with Meng. Sting’s run with the belt wasn’t meant for the belt to be elevated like Cena’s run in 2015 but was booked to keep him relevant. The guy got pushed aside this year for The Renegade. Speaking of the The Renegade, Paul Orndorff is tasked with doing what Arn Anderson couldn’t and that is having a good match with him. It doesn’t happen as Renegade hits a woeful dropkick during the match and that is the high point of the match. The crowd boos him after the match and cheers Wonderful when he piledrives the off-brand version of the Ultimate Warrior. I will give the company points for having Orndorff using sand as a weapon, though. We wrap up the undercard with DDP vs Evad Sullivan, a match that is somehow better than The Renegade match. It’s still a bad match and Evad Sullivan being a dyslexic doofus with the hots for Kimberly is just a bad angle. It did give us the first WCW appearance of The Disco Inferno though. Evad, much like Sting had been pushed aside for The Renegade but he could have served a purpose around this time. What do I mean? Keep reading. Wrestling promoters has never been shy about exploiting dead wrestlers to line their pockets. From Fritz Von Erich forcing a ref to forge autographs of his dead son David, Eddiesplotation, Paul Heyman dressing at the recently deceased Paul Bearer and the Warrior Award are some fine examples of that. The debut of The Giant and billing him as Andre’s son was primo exploitation of a legendary figure that appeared once on WCW TV. The Giant had appeared as the previous two PPVs, once appearing at the curtain and going after Jimmy Hart and it worked. This was enough and you didn’t need to shoehorn Andre into the angle, you have this intriguing monster that is gunning for Hogan. That’s all you need. Have Sullivan stumble onto this monster at a demented circus or living in the woods. It was intriguing to wonder why this monster was stalking Hogan and company and even this angle isn’t bad but deserving of a spot because of the aftermath of the segment. WCW would begin to push the exploitation in the lead-up to Halloween Havoc with Hogan saying some truly awful lines about burying The Giant just like he buried his father. When we cover Halloween Havoc 1995, I’ll go in-depth on my distaste for the angle when the company. The Ric Flair vs Randy Savage “Lifeguard” match isn’t a bad match but it’s a major disappointment after the awesome match these two had at The Great American Bash in June. It’s a better match than their WrestleMania VIII encounter in my opinion. Savage was full of fire after Flair attacked his father at Slamboree, helpless to watch as Flair put his dad in the figure four leg lock. Savage is fighting for family and for his pride while Flair is back at peak form as the dirtiest player in the game. It’s the best main event WCW in nearly a year and it would be the last great WCW main event until the Hostile Takeover match a year later. While this match is watchable, it just feels lifeless and dull after their previous match. Lumberjack matches are never good except for Ambrose vs Rollins at Summerslam 2014 and this is the just the wrong gimmick match for this feud, especially since this is the blow-off match. Something like a Falls Count Anywhere would have been great and would have made great usage of having the show on a beach. Flair taking a backdrop into the Pacific Ocean would have redeemed this entire show. A cage match would have been great and if you were holding this show at an arena that would get fans to pay. Just bringing that up. We did get an Arn Anderson DDT though and that will always brighten my day. WCW was divided into two factions backstage with Flair and Hogan in a power struggle over direction of the company. Flair wanted the company to turn back the clock to the late 80’s NWA with Flair leading the Horsemen and bringing back The Road Warriors while Hogan wanted to recreate The Hulkamania Era with as many WWF stars as possible. This led to The Renegade being created when The Ultimate Warrior demanded a ludicrous contract to come in. Well, Hogan won by looking at this card. Every match on this show except for DDP vs Evad Sullivan featured a former WWF star. You can put an asterisk next to Orndorff and The Nasties since they had debuted in 1993 but this is a radical shift from the year before. Savage, Kamala, Duggan, Zodiac, Meng and you can lump The Shark in there too. This is before WCW plucked stars like Benoit, Eddie, Malenko, Mysterio, Ultimo and Jericho to fill up the midcard so these guys were filling up cards and stinking up the joint. Alex Wright is an underrated talent but he was saddled with a terrible dancing gimmick while Brian Pillman was floundering with a terrible gimmick of moving to California to be on Baywatch. While Flair did take his lumps during this period, he isn’t innocent when it comes to sabotaging talent. Many put the blame for Vader’s downfall in the American wrestling scene on Hogan or Shawn Michaels, but I put the blame on one man. Ric Flair. When Flair took over as head booker, Vade went from being a monster who could kill people by himself to relying on Harley Race to help him win matches. He took a sharp turn down the cardVader has even talked about this in interviews citing Flair taking over as booker was the start of his decline. The most egregious example was Starrcade 1994 against Jim Duggan for the US Championship. You think that Vader would dominate Duggan to set him up for Hogan, right? Nope. Vader gets beat up for most of the match and wins thanks to Harley interfering. That is the wrong way to build up a monster for Hogan to slay. 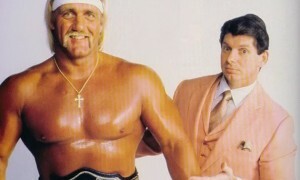 Hogan’s smart, he knows his bread and butter has always been The Hulkster overcoming a dominant monster. This match was the end of Vader’s rapid decline, as the company had booked him as more of a henchman for Flair and the Dungeon of Doom. The guy was perfect with Harley Race and he really didn’t need to be a pawn in the war against Hulkamania or the ultra-cheesy Dungeon of Doom. Have Vader be Vader, a monster intent on destroying Hulkamania. Vader also suffered a nasty shoulder injured that would hinder him throughout his WWF run when he tried A SHOOTING STAR PRESS. The match isn’t bad but it lacks suspense since nobody bought Vader as a legitimate threat to Hogan as this point. In the three PPV matches he had with Hogan, Vader didn’t even win the tag match with Flair against The Mega Powers at Slamboree. I will give the big man credit, he was smart in not letting him Hogan pin him compared to Flair, thus Hogan winning by escaping the cage. It’s a disappointment considering the talent involved and Vader’s sudden face turn after the show feels forced. Bash at the Beach 1995 is a terrible show thanks to a dreadful undercard and two disappointing main events. The beach-front setting is nice and they did a good job with the production, good production doesn’t equal a good show. The Hogan/Vader feud could have done massive business if Hogan would have been willing to let Vader beat him at Superbrawl. I’m not talking about interference, I’m talking a clean finish. Vader hits the powerbomb and hits the Vaderbomb’s Hogan repeatedly before the ref calls the match off. Have Hulk bite down on a blood capsule to simulate internal bleeding. Hulk doesn’t get pinned in this scenario and you can have interviews with Hulk contemplating retirement after his kids witnessed Vader destroy him. Evad Sullivan stands up for Hogan and challenges Vader to suffer the same fate and receive numerous Vaderbombs. That gives Hogan the motivation to hit the gym and challenge Vader to one last match at Bash at the Beach in Hulk’s backyard. It’s all or nothing brother.